Azul's planned merger with fellow Brazilian carrier TRIP is yet another shift in Azul’s business strategy since its Dec-2008 launch. The first adaption occurred in 2010 when Azul unveiled plans to add a second fleet type to its all Embraer E190/195 fleet. ATR 72 turboprops were introduced in 2011 to accelerate Azul's growth into smaller domestic markets, which have been expanding faster than trunk routes as Brazil's regional centres have benefitted from the rapid growth in the country's economy. Now just weeks after Azul founder and chairman David Neeleman dismissed any need for the low-cost carrier to participate in the merger and acquisition activity engulfing Brazil’s major airlines, Azul has unveiled its tie-up with TRIP. The merger further accelerates Azul's growth targets and firmly places the new combined company in a strong third place in the Brazilian domestic market behind TAM and Gol, creating a significant market share gap between the newly established Azul Trip SA and its now much smaller competitors. Azul is pursuing the merger with TRIP as demand in the booming Brazilian domestic market has slowed over the last year, leading Gol and TAM to put the brakes on domestic capacity expansion in hopes of creating a more favourable supply-demand balance. 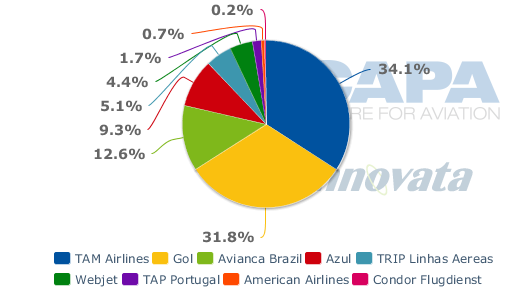 Based on statistics from Brazil’s civil aviation authority ANAC covering Jan-2012 to Apr-2012 Azul held a 9.9% RPK share in the Brazilian domestic market while TRIP’s share was 4.2%, giving the new company about a 14% share. Azul-TRIP is currently about 9 ppts ahead of Avianca-Brazil and about 8 ppts ahead of Webjet, which is in the process of being acquired by Gol. 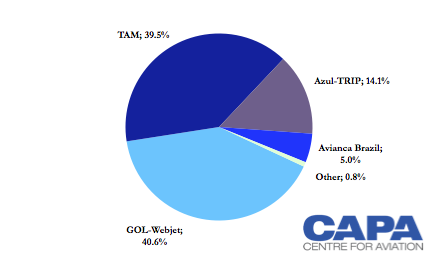 The Gol-Webjet combination now accounts for just over 40% of domestic RPKs, roughly matching the 40% share from TAM. The powerful trio of Gol-Webjet, TAM and now Azul-TRIP will control 94% of the Brazilian domestic market, highlighting the huge consolidation that has taken place over the last several years in the once highly fragmented Brazilian industry. When factoring in fast-growing Avianca Brazil, four players – two LCCs and two full service airline groups – will control over 99% of the market. Given the huge size of the Brazilian market and the growth opportunities in this important emerging market, this should position all four carriers for sustainable growth and profitability. Compared to the other BRIC countries of Russia, India and China, Brazil's aviation industry now has the smallest number of major players. The new Azul-TRIP combination will likely continue to rapidly grow its market share, reaching 20% as early as the end of this year at the expense of TAM and Gol. Given their commitments to further expand their fleets, Azul-TRIP should capture a 25% share of Brazil's domestic market within two or at most three years. Mr Neeleman told CAPA in Nov-2011 that Azul alone aimed to secure a 15% share of the Brazilian domestic market by the end of 2012 as it planned to again rapidly expand capacity in 2012. ANAC data for the first four months of 2011 show ASK growth of 41% for Azul, indicating Azul should be on target to meeting its end 2012 goal (excluding TRIP). TRIP also has been growing rapidly, with ASKs up 66% in the first four months of 2012. While Azul and TRIP continue to expand rapidly – as each carrier has been taking delivery of additional aircraft at a rate exceeding one per month – Gol and TAM are now projecting slightly negative or flat domestic capacity for 2012. As a result, Azul, TRIP and smaller Avianca Brazil are expected to rapidly grow their shares of the market this year (Avianca Brazil ASKs were up 107% in the first four months of 2012 and the carrier's market share has already doubled over the last year from 2.5% to 5%). The merger, if approved by Brazilian authorities, ensures Mr Neeleman will more rapidly meet his market share goals. He was quoted by Bloomberg as saying the TRIP merger gives Azul the equivalent of four years of growth. In addition to rapidly accelerating its growth curve, Azul will automatically gain access to numerous markets where it currently does not operate. 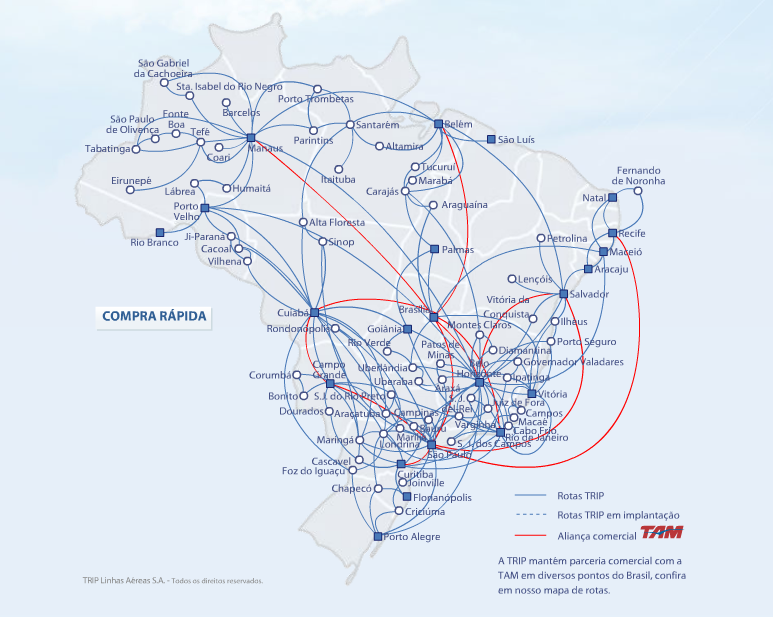 TRIP has the largest domestic network among all Brazilian carriers, serving 88 cities. Azul currently serves 48 destinations. While both carriers have a similar focus on secondary markets below the radar screen of Gol and TAM, which do not operate any aircraft smaller than the Boeing 737-700 and A319, Azul and TRIP so far been able to both expand rapidly without significant network overlap. From a network perspective, this makes the merger particularly appealing as the two have similar market development philosophies and complementary networks. Only one route, Campinas-Belo Horizonte, is featured among the top 10 routes for both Azul and TRIP. 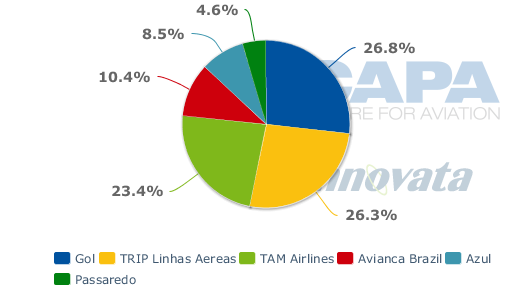 While Campinas-Belo Horizonte is Azul's second largest route with about 12,000 seats per week, TRIP has a relatively small presence in the market with about 3000 seats per week, making it the carrier's seventh largest route, according to Innovata data. TRIP generally focuses more on thinner routes, often with limited frequencies, while Azul's model has traditionally focused on stimulating demand in under-served and, in many cases, previously unserved markets with multiple daily frequencies. Mr Neeleman, however, told CAPA last November that he expected more competition with TRIP was inevitable in 2012 as both carriers continued to launch new point-to-point routes avoiding Brazil's congested hubs. He said at the time that about 55% of Azul's routes are not served by any other carrier. "We’ll start crossing with TRIP next year. But we have a really strong brand. We are not concerned about it,” Mr Neeleman said. While Azul was never concerned about the prospect of more competition with TRIP, now that the two carriers are one this potential challenge is eliminated entirely and the new merged company will enjoy a powerful position in Brazil's large and fast-growing regional sector. The decision by Azul and TRIP to combine their operations is also a logical evolution from a fleet perspective. Both carriers operate Embraer E-Jets and ATR turboprops, which will allow for a smooth fleet integration and improved fleet optimisation after the integration is completed. The two carriers now operate a combined fleet of 62 E-Jets and 50 ATR turboprops. The E195 forms the backbone of Azul's fleet but the carrier also operates slightly smaller E190s as well as ATR 72-200 and ATR 72-600 turboprops. The ATR 72-200s, which were acquired last year on short-term leases, are being returned this year as new-generation ATR 72-600s are delivered. TRIP also operates E190s, smaller E175s as well as a wide mix of ATR 42 and ATR 72 turboprops. In its first decade TRIP only operated turboprops but it has been rapidly growing its regional jet operation since taking its first E-jet in 2009. Both carriers now operate the ATR 72-600, the latest generation of 70-seat turbopops from ATR which entered service last year. ATR 72-600s will rapidly become the backbone of the Azul-TRIP turboprop fleet as the carriers combined are committed to acquiring nearly 40 additional ATR 72-600s beyond the 12 they already operate. While Azul was planning to only operate ATR 72-600s, the new Azul-TRIP will likely continue to retain – at least for now – some smaller ATR 42s which TRIP uses for thinner routes. Azul also has an additional 25 E195s on order. TRIP has some commitments in place to expand its E190 fleet, although unlike Azul traditionally the carrier has relied on the leasing market and small rather than large bulk orders to meet its expansion requirements. Both carriers are based at Sao Paulo alternative airport Campinas Viracopos, which makes combining operations easier and creates opportunities to eliminate some redundant office functions as the airlines proceed with their merger. Azul has been the dominant carrier at Campinas since shortly after its late 2008 launch. Although TRIP is based at Campinas, it currently accounts for only 3% of the capacity at the airport, according to Innovata data. Campinas is not even among TRIP's largest 10 bases. Unlike Azul, TRIP has a presence at Sao Paulo's main international airport, Guarulhos. 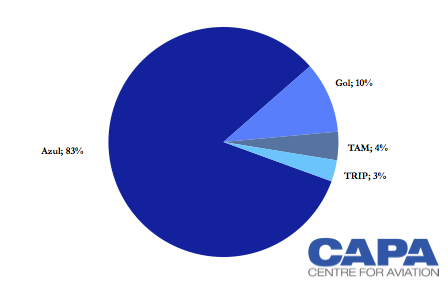 But TRIP's operation at Guarulhos is very small compared to Gol and TAM as the carrier only accounts for 8% of domestic capacity (seats) and 6% of total capacity at Brazil's largest airport. Neither TRIP nor Azul have regular operations from Sao Paulo's downtown slot-controlled domestic airport Congonhas although Azul operates some weekend flights into Congonhas. Based on current capacity data, Congonhas is Brazil's second largest airport. It remains to be seen how a lack of slots at Congonhas, as well as small single-digit presences at Brazil's other top four airports – Guarulhos, Rio de Janeiro Galeao and Brasilia – will ultimately impact Azul-TRIP. In order to continue its rapid growth, eventually the group may need to find a way to increase its access at these key high yield airports and bring in narrowbody aircraft such as the A320neo or 737 MAX. But with Gol's acquisition of Webjet last year and Avianca Brazil unlikely to sell given its ties to the Avianca-TACA Group (the two for now are sister companies without any cross-ownership), there appear to be limited options for Azul-TRIP. Staying away from Brazil's trunk routes, which in many cases currently face over capacity, is a smart move for now but in the end could keep Azul-TRIP from approaching Gol or TAM in overall market share. Azul's network is significantly more concentrated than TRIP's network. 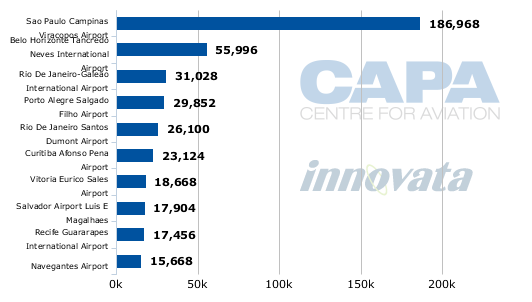 Campinas accounts for over 60% of the carrier's capacity, according to Innovata data. Azul also has relatively large operations in Belo Horizonte, both Rio de Janeiro airports and Porto Alegre but has a limited presence in some regions of Brazil, particularly in the northwest. TRIP also has a large operation at Belo Horizonte and Rio de Janeiro Santos Dumont. With TRIP, Azul will gain an important foothold into Brazil’s interior and the northwestern region of the country. For example, the merger will allow Azul to capitalise on TRIP’s presence in Manaus, where TRIP currently has a 14% share of capacity and accounts for nearly 33% of the airport’s movements. Azul only serves two destinations from Manaus with 11 weekly flights while TRIP serves 15 destinations from the airport. The merger particularly bolsters the position of Azul and TRIP at Belo Horizonte, which is an important economic centre in southeastern Brazil. Belo Horizonte is the sixth largest airport in Brazil based on current capacity data, behind the two Sao Paulo airports, the two Rio de Janeiro airports and the capital Brasilia. Belo Horizonte is TRIP's largest base and Azul’s second largest base. Combined the two carriers will account for over 30% of the capacity at the airport, surpassing TAM’s 20% share. But the Azul-TRIP combination will still lag behind the combined Gol-Webjet share at the Belo Horizonte, where Gol has a large operation and its maintenance base. Gol and Webjet combined now account for about 45% of capacity at Belo Horizonte. While overall there is not much overlap in the Azul and TRIP networks, there is some overlap at Belo Horizonte. Both Azul and TRIP now link Belo Horizonte with several destinations including Recife (also served by Gol and Webjet), Salvador (also served by Webjet and TAM), Campinas, Uberlandia (also served by Gol, Webjet and TAM), Vitoria (also served by Gol), Porto Alegre, Port Seguro (also served by Gol, TAM and Webjet) and Montes Claros (also served by Gol). 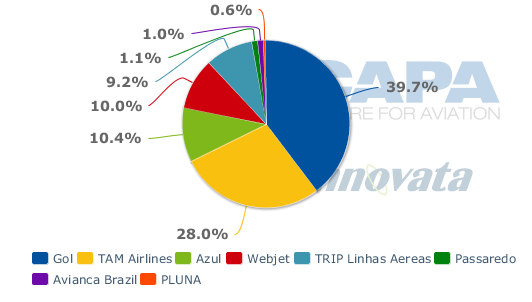 Other airports where the Azul-TRIP merger will significantly boost their presence include Rio de Janeiro Santos Dumont, where Azul's 9% seat share and TRIP’s 7% share will total about 16%. Santos Dumont, a domestic-only airport situated in downtown Rio de Janeiro, is currently the fifth largest domestic airport in Brazil based on capacity. Only Azul currently operates at Rio de Janeiro Galeao, where the carrier accounts for a 9% share of capacity. Galeao is the fourth largest domestic airport in Brazil and the second largest international airport. At Curitiba in southern Brazil (the country's eighth largest airport based on domestic capacity) Azul’s 10% share combine with TRIP’s 9% to form a nearly 20% share, inching the combined carrier somewhat closer to TAM’s 28% seat share at the airport. At Recife, the 11th largest domestic airport in Brazil, Azul and TRIP combined will account for about 14% of the airport’s seat share. Once Azul and TRIP combine they will become the dominant carrier at Cuiaba, accounting for a 35% share of capacity, which will surpass Gol’s current 27% share. Webjet does not serve Cuiaba, which is the 18th largest domestic airport in Brazil. Mr Neeleman told Bloomberg the newly established company Azul Trip SA would generate BRL4.2 billion (USD2.2 billion) in revenue in 2012, compared with Gol’s BRL7.5 billion (USD3.8 billion) of revenue recorded in 2011 and TAM’s BRL13 billion (USD6.5 billion). The combined revenue results from Azul and TRIP bringing together largely complimentary Brazilian networks which rely on smaller markets that, unlike the country’s major trunk routes, have not suffered from overcapacity. The combined companies will operate over 300 routes within Brazil and more than 800 daily flights. The carriers say they will operate separately until gaining the requisite government approvals for their merger, but explained they are studying whether to eliminate one of the brands. TRIP has served the Brazilian domestic market since 1998, but Azul has rapidly gained a following in its four short years in existence. With Azul having a controlling stake in the combined company, it is more likely the TRIP name would fade away. Mr Neeleman eventually anticipates exiting at least partially via an an initial public offering but told CAPA last year that market conditions are currently not favourable for an IPO and he is no hurry to go public. Azul will control 67% of the new combined company with TRIP retaining the remaining 33%. Mr Neeleman owns a majority stake in Azul and will also have a majority stake in Azul Trip SA. US investment firm TPG, which is a frequent investor in the airline industry, holds a minority stake in Azul. The Caprioli family own a majority stake in TRIP. Coinciding with the new agreement between Azul and TRIP, the 26% stake in TRIP previously held by US regional airline group SkyWest was reportedly bought back by TRIP. The Caprioli family has been seeking new investors for some time to help support TRIP's ambitious expansion plan. Last year TAM unveiled plans last year to acquire a 33% stake in TRIP as part of an expanded partnership between the two companies. But the proposed deal lapsed at the end of 2011 without a final agreement. TAM and TRIP were already codeshare partners and as of the end of 2011 had a codeshare covering 211 TRIP-operated regional routes throughout Brazil. TAM now risks losing valuable feed from fast-growing regional destinations. TAM could be compelled to re-look at its strategy for the regional market. TAM at the end of 2009 acquired small regional carrier Pantanal but quickly replaced that carrier's ATR fleet with A320s. TAM's roots are as a regional carrier but the carrier has decided to focus in recent years on trunk routes. The strategy of merger partner LAN has also traditionally been to focus on routes large enough to support A320 family aircraft, leaving the smallest market to others. Azul reportedly began negotiations with TRIP in late 2011 and early 2012, which likely means that Mr Neeleman and Azul engaged in a quick recalculation over the effects of increased competition with TRIP as demand in the Brazilian domestic market place continue to show signs of weakening. 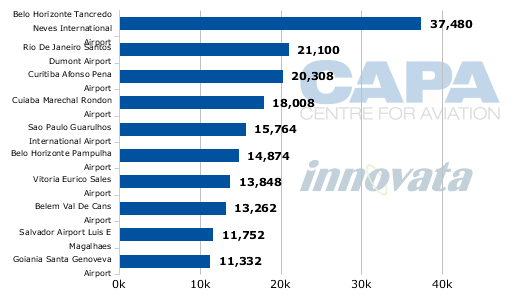 Even as Brazil’s largest carriers Gol and TAM start to adjust capacity, the latest data for Apr-2012 show the 7% capacity growth in the overall Brazilian domestic market outpaced the 5% year-over-year increase in traffic. For the first four months of the year, capacity was up 10% while RPKs were up 7%. Industry capacity growth is expected to remain in the single digits for the rest of the year as the recent capacity adjustments at market leaders Gol and TAM are fully implemented. Azul was unable to match its 41% increase in ASKs for the Jan-2012 to Apr-2012 period as its RPKs grew by 39%, resulting in a 1.2 ppts slip in load factor. But at 79% Azul still had a load factor well above the industry average of 72.3%. TRIP and Avianca Brazil both have been able to buck the industry trend and grow traffic faster than capacity so far this year. 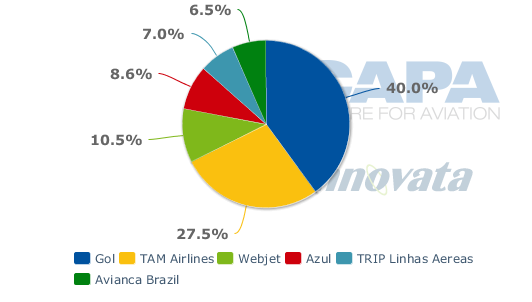 Through the first four months of 2012, TRIP has grown its RPKs by 73% on a 66% increase in ASKs while Avianca Brazil has been able to outstrip its 107% growth in ASKs with a 111% increase in RPKs. With a 79.3% load factor, Avianca Brazil has taken over from Azul the distinction of having the highest load factor in the Brazilian industry. TRIP's load factor has traditionally been low as its network consists mainly of small regional routes. But as TRIP has added larger regional aircraft and expanded into larger regional routes its load factor has been improving. TRIP's load factor of 66.9% through the first four months of 2012 was still below the industry average but was 2.7 ppts above its load factor from the first four months of 2011. It is not clear how the wave of consolidation in the Brazilian market will affect Avianca Brazil once the mergers between LAN and TAM, Gol and Webjet and Azul and TRIP are complete. Avianca Brazil bills itself as a full service carrier that offers the most generous seat pitch in Brazil for economy-class seats and has previously said it was able to maintain its fares in 2011 as Gol and TAM suffered from consistently weak yields. The consolidation could open up an opportunity for Avianca Brazil to continue to build its niche, if passengers remain willing to pay a premium for the carrier’s full service offering. Opportunities could also open up for Passaredo, which is Brazil's only other regional carrier of significant size. While Passaredo is small, accounting for only 0.6% of RPKs in Brazil's domestic market so far this year, it recently ordered 10 ATR 72-600s to supplement its fleet of 50-seat ERJ-145s. Passaredo earlier this month forged an exclusive interline partnership with Gol. The two carriers may now look to expand their partnership, including through a possible equity stake, leading to faster growth at Passaredo in the aftermath of the Azul-TRIP merger. Along with uncertainty over whether one or two brands will be retained, questions will arise over how the combination of Azul and TRIP could alter each carrier’s respective business model. TRIP is a relatively low-cost operation and has borrowed some elements of the LCC model, but it is generally considered a full service regional carrier. TRIP has not tried to stimulate demand like Azul has with its generally lower fares. This is reflective in the big load factor gap – currently about 12 ppts – between the two carriers. It remains to be seen if TRIP will now adjust its approach and perhaps look to boost its load factor at the possible expense of yield. At 14 years of age TRIP also has a older, more senior workforce that will need to be merged into Azul’s overall younger employee ranks. This could ultimately create cost pressure for the combined carrier. Previously Azul had concluded numerous opportunities were present in the Brazilian domestic market and therefore international expansion was not a huge priority for the carrier. But by combining with TRIP and accelerating its domestic growth, the combined company may now look to make inroads into Brazil's international market sooner than planned. Azul recently announced it would introduce a seasonal route to Punta del Este in Uruguay by year-end. Azul until now has only operated international routes on a charter basis while TRIP has remained entirely a domestic operator. 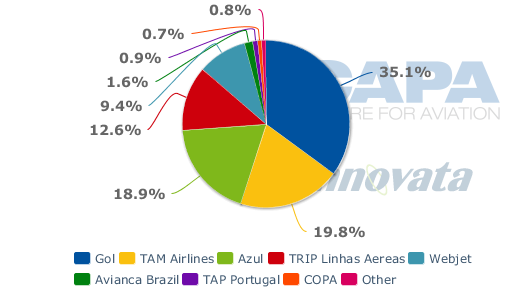 The opportunities in Brazil's international market are huge given that TAM now accounts for almost 90% of international ASKs among Brazilian carriers. Azul-TRIP will inevitably seek to launch several routes to neighbouring countries and could possibly even look at establishing a LCC joint venture carrier in other Latin American markets as the region liberalises. But Gol is also now re-looking at international expansion after several years of cutting its international network, with flights to the US likely to resume later this year. Avianca Brazil will also likely expand its very limited international network as part of a broader push in the region by the Avianca-TACA Group. While the Azul-TRIP combination seems to be a logical evolution in Brazil’s rapidly changing market place, it could also be a sign that even the country’s smaller carriers are not as confident as they once were about the growth prospects in secondary domestic markets. As Brazil’s GDP slows to 3% this year, the country’s emerging middle class could feel a squeeze, pressuring demand even in the most under-served markets. The tie-up could be a proactive move by Azul and TRIP to build a stronger carrier to withstand any declines in demand that ensue.